Citizens of EEA countries have the right to live and work in the UK under European law. Any family members or the spouse of an EEA National can also enjoy the right to live and work in the UK alongside the EEA national – even if they do not belong to an EEA nation themselves. Any citizen of an EEA country wishing to take up residency in the UK is also permitted to bring their dependant family. If the candidate is the national of an old EEA country then they can enter the UK with minimum documentation. The candidate is not required to apply for entry clearance but may be asked to provide some evidence such as their passport or national identity card for verification. EEA nationals do not require a UK work permit for any of these employment opportunities. No employment offer is required for an EEA family permit application. If the applicant can support themselves and any dependant while staying in the UK, this is a fairly straightforward route for living and working in the UK. For more information about the EEA family permit, contact our team of experts on +44 (0)20 3627 4777. The EEA Family Permit is granted for a period of 5 years where the holder is entitled to unrestricted employment opportunities. The EEA national will need to spend 4 years and 11 months in the UK on this permit. After 5 years continuous stay in the UK, permit holders are eligible to apply for Indefinite Leave to Remain. If the EEA citizen does not have a residence permit and is coming from outside the UK, they are issued with a 6-month EEA family permit in which they are permitted unrestricted employment in the UK for this duration. The EEA citizen is expected to apply for a residence permit within these 6 months and their dependants should at the same time apply for the EEA Family Permit. EEA nationals wishing to set up a business in the UK must submit a detailed business plan. 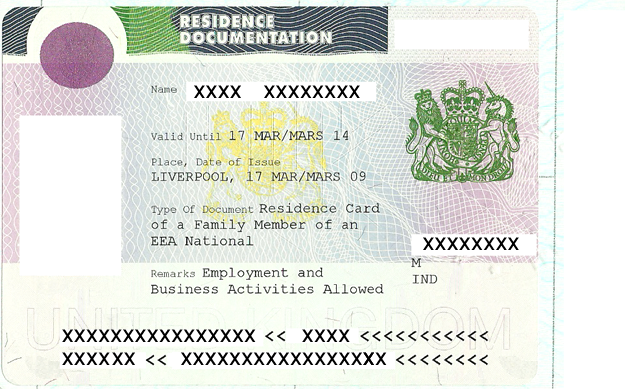 This permit is usually granted to those who wish to come to the UK for an extended period of time. Applications are likely to be unsuccessful if they are for stays of less than three months. This immigration route is not intended for work. Applications are declined if the reason for entering the UK is for employment purposes. Distant relatives of an EEA national may also come under the definition of a family member if they can prove that they are financially dependent on the candidate. In case the candidate is a student, only his or her spouse or civil partner or any dependant children will be entitled to a right of residence. If you are in the UK Illegally or have overstayed your visa, you will still be able to apply under this category being a spouse or child of an EEA National. Whilst the permit is for 5 years, EEA nationals are able to apply to stay in the UK indefinitely. After successfully completing a period of 5 years in the UK, EEA nationals become eligible to apply for Indefinite Leave to Remain, also known as permanent residence. Those EEA nationals who have successfully obtained Indefinite Leave to Remain (ILR) are then eligible to apply for British naturalisation. Permanent Residence in the UK is granted only to those individuals who have lived in the UK for 5 years and have excercised their treaty rights in the UK, with proof of a continuous 5-year period for the respective categories under the EEA regulation of 2006. Not remained outside the UK for more than 2 years whilst on their visa (this does not apply to British Overseas Citizens and British Protected Persons). Not undertaken any activities that would be regarded as a criminal offence. Occurrence of any of the above conditions can lead to loss of Indefinite Leave to Remain status, so it is crucial that all conditions are adhered to by the applicant. The ‘Surinder Singh’ route is a route for British citizens to bring their non-EEA dependant family members to the UK using the EEA Regulations as opposed to the strict UK Immigration Rules. The British citizen needs to exercise their treaty right as either a worker or a self-employed person in another EEA member state for a period of time, they can then bring their non-EEA dependant relative to the UK under the EEA Regulations as they have exercised their right to free movement in other EEA member state. Benefits to this route include not having to meet the very strict financial requirements under Appendix FM of the Immigration Rules that affect many applicants and their families. the degree of integration of the British citizen into the EEA State. abuse of the rule is not permitted. This case gives the requirements for ‘Surinder Singh’ to be engaged, that the period of residence in an EEA State should be at least three months, and that during the period of residence family life must have been strengthened or created. The dependent child aged under 18 of a primary carer in one of the categories set out above, where requiring that dependent child to leave the UK would force the primary carer to leave the UK with them. Want to apply for an EEA family permit but have a complex case? Complete the below free assessment form to get started.